Maybe it’s because I spent time in Japan that I appreciate the use of unused or under used space for storage. Futons that roll up, and bedding that gets stowed under tatami floors. In many older buildings, including my 1940’s home, the hallway is central to the home and a prime example of underused space. German designer, Vanpey, has turned this space into a storage haven with a range of narrow hanging storage and shelves. 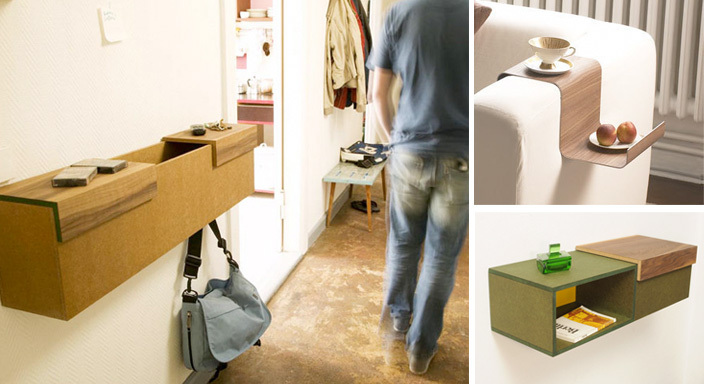 His trough-like Kommod, is perfect for storing seasonal items, while the sliding shelves above are perfect for keys and other things that you find when you empty out your pockets. The rest of the line includes more clever solutions for modern living – a sofa tray for coffee and snacks, a laptop shelf just perfect for quickly checking email, sports results and, of course, this blog. Check out more from Vanpey website, where you can also view slideshows about how the products work and how you can assemble the furniture while looking stylishly European!